The Benny Hillifier makes any video exactly as funny as Benny Hill! Yes, any video. Great interview with the warped director/icon John Waters. I’ve started listening to the CBC Ideas podcast series How to Think About Science, which promises to be quite interesting. Finally, learn to recognize your brain’s craven and deceitful nature with wikipedia’s list of cognitive biases. You know, for a movie I thought was pretty flawed, I’ve spent a lot of time thinking and reading about Watchmen. If you ask me nice, maybe I’ll tell you more of my thoughts, but for now, here are some links I liked. Patton Oswalt (who should just go ahead and crown himself the king of 30-something comic-book nerds) hasn’t seen Watchmen yet, but he thinks you should. He also thinks you should watch more TV. The AV Club’s Tasha Robinson compares the book to the film, and comes away loving both. Though I do disagree with her take on the film’s ending, which I like more the more I think about it. Roger Ebert makes Watchmen the focus of one of his patented brilliant, rambling essays, talking about the metaphysics of Dr Manhattan. And finally, Saturday Morning Watchmen! It’s short, but awesome and funny and a little creepy! Kind of like me. New and upcoming media edition! Roger Ebert writes a kind of four-star anti-review of Synecdoche, New York, and is then inspired to write a rambling, poetic essay on it. Chuck Klosterman reviews Chinese Democracy, which he likens to Timothy Treadwell being eaten by a bear. Just one of many reasons why Chuck Klosterman is the reigning king of brainy hipsterdom and I’m just some guy. I haven’t seen a good overview of Tarantino’s upcoming Inglourious Basterds anywhere, but Wikipedia rounds up most of the details that are available. Apparently, it’s a Spaghetti Western-and-French New Wave-inspired take on the WWII action flick, with Brad Pitt as the leader of a group of Jewish-American soldiers who infiltrate occupied France to collect Nazi scalps. And it has Maggie Cheung as a Frenchwoman. Frankly, it sounds awesome. 2007 Independent Games Festival grand prize winner Aquaria has finally been released for OS X. I only just started it, but I’m pretty impressed so far. It’s beautiful and oddly meditative for a side-scrolling action game. Finally, I can live my dream of being a magical fish-woman who swims around in the ocean singing songs and collecting recipes! Janelle’s visit was a great opportunity to get out and explore my new neighbourhood — when I’m by myself, I have a tendency to sit on the sofa surrounded by my laptop, DVDs, books, guitar, Atari 2600, and other amusements. As, for instance, right now. But can you blame me? Those 900-page Nixon exegeses and compilation volumes of Y: The Last Man aren’t going to read themselves, you know. And who will listen to all those Spaced commentary tracks if I don’t? You? My neighbour, who’s name may be Frodo or something that sounds like Frodo? Don’t make me laugh. And yes, I know I’ve plugged Spaced a lot lately. That’s because it’s awesome and I want you to go out and buy or rent or borrow it already, so you can thank me for turning you onto it. Hmmm… I got a little off-track. What I wanted to say was that even a boring homebody like myself needs to get out of the house and do stuff every once in a while, which was going to lead into a clever segue about this web site: Walk Score. Which is, itself, pretty clever. You give it an address, and it generates a “walkability” score that tries to give an idea of how easy it is to get around the area on foot. It’s based on research that having lots of nearby amenities is the strongest predictor of how much people will walk. 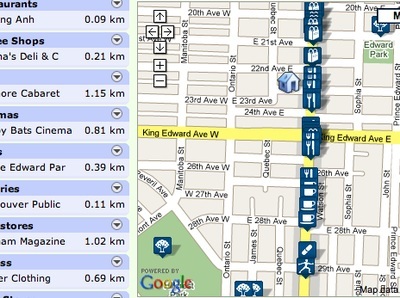 Using Google Maps, it computes the distance from the location to each of a checklist of amenities like grocery stores and movie theatres and sums up the score to get a walkability rating from 0-100. Most of Manhattan scores in the high 90s. Sprawls like Charlotte and Jacksonville average in the 30s. But this is still a pretty cool tool for someone like me who makes a point — and self-righteously at times, I might add — of not having a car. When I was looking for an apartment back in May, I really started to appreciate just how important it was to me to be somewhere walkable. So important, in fact, that I confined my search to places I knew had everything I needed nearby. It worked out, but to be honest, I still feel like I totally lucked out to land an apartment I like in such a plum location. With this tool, I might have been able to expand my search, instead of just rejecting the entire East Side out of hand.